Reminder: All solid waste services in the community will occur as usual over the Memorial Weekend holiday. There will be no interruption or delay of services. Waste Management will provide curbside pick-up of trash, recycling, and yard trimmings to all residents on their regularly scheduled service day, including Monday, May 28, 2018. Simple Recycling will also be providing curbside textile recycling with no service interruption. Please note that the Precinct 3 Recycling facility will be closed on Monday, May 28. 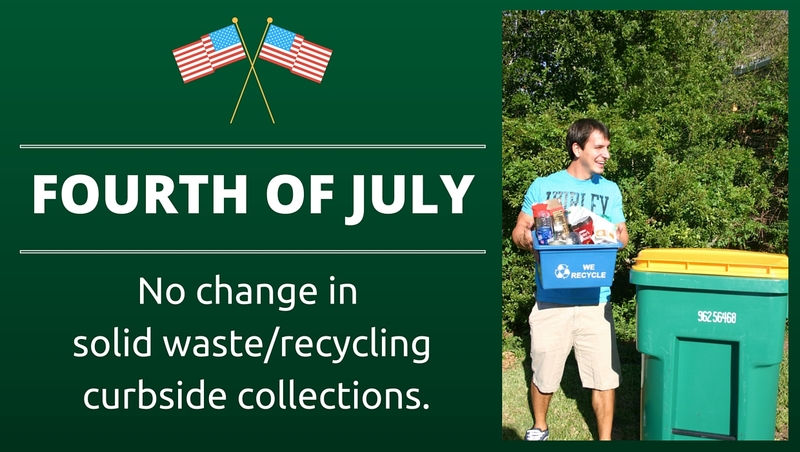 The Woodlands Recycling Center on Research Forest Drive will be open every Wednesday from 4 to 7 p.m. and Saturday from 9 a.m. to 2 p.m. regardless of holidays. Per the 2018 Holiday Collection Schedule, the only holidays that will affect residential trash and recycling collection this year will be New Year’s Day, Thanksgiving Day, and Christmas Day. Find more information about trash and recycling services – visit Environmental Services online. To report missed pick-ups, please call Waste Management Customer Service at 800-800-5804.